How cool would it be, if you were able to create a ranking of top posts in the blink of an eye? We integrated an incredible new feature into our analysis tool that allows you exactly that. You can now load, analyze and export complete post rankings of Facebook, Instagram, Twitter, Pinterest, YouTube, and LinkedIn Profiles. The new post ranking displays all posts of all profiles that are of interest to you. This includes your own profiles, as well as strange profiles, like for example those of your competition. All you have to do is add a selection of profiles to a dashboard and pick a time frame. Fanpage Karma immediately shows you all the posts that were published by the profiles in that time. In the Facebook Insights you can also display a post list of your Facebook Page. However, the network only shows you the list of posts of one of your own profiles at a time. Our post ranking displays all of the posts of any public profile at one glance. This is a huge time saver. You can analyze the posts of the list by the criteria that are important to you. It is, for example, useful to compare the posts of your own pages with the posts of your competitors. Pick a selection of the numerous metrics of the different networks. The ranking then gives you the respective values. You can now sort the ranking by a chosen indicator to find out which posts were most successful. In addition to posts that were published by the profiles you are able to create rankings of user posts and Instagram Stories. To specify your post ranking you can filter the results by freely selectable keywords. If you type the keyword “football” into the search, for example, you will get all the posts that contain “football” in their post description. Like that, you can browse posts for different subjects in no time. The complete post ranking can be exported into Excel and PowerPoint. You can then process the results for your own use. What were your most successful Posts? 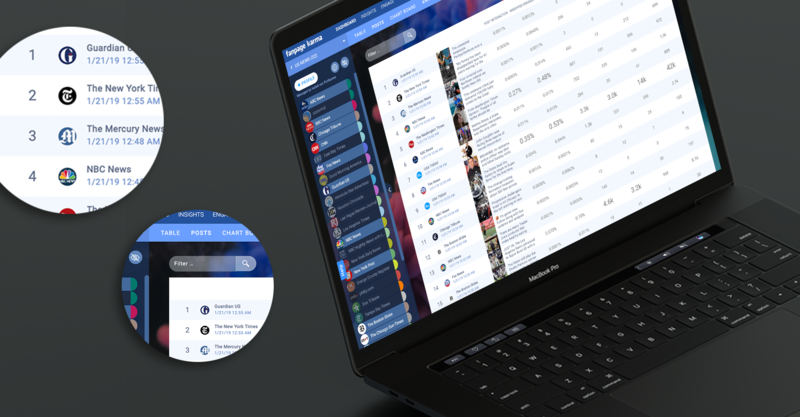 Add your social media profiles to a dashboard and find out which of the posts gained the most attention. You can try out the Post Ranking two weeks for free. Soon you will even be able to set the time frame of your post ranking on today. This is an improvement that you cannot find in any other post analysis. The posts will not be loaded during the night, as usual, but every 10 minutes. The Live Ranking will be accessible as of the Business Version of Fanpage Karma.